A newly opened hole in the wall in Toronto's Kensington Market, Agave & Aguacate has become my newest Mexican obsession! 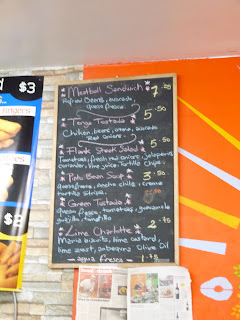 Run by Chef Francisco Alejandri, a former Stratford Chef School grad, this Mexican stall you could almost call it (as it is in a store with about four other vendors selling their own specialties) focuses on "Fresh Mexican take-out with quality in mind." Featuring the "tostada", Agave & Aguacate is quickly making a name for themselves, being named a daily lunch pick by the Toronto Life. 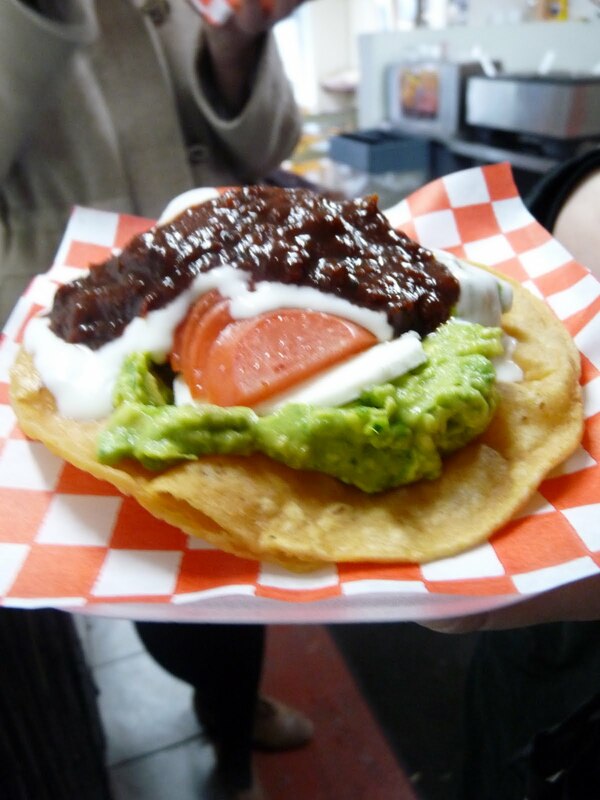 A tostada is a dish where the base is a toasted form to hold the meal. In this case Alejandri's tostada is a fried tortilla so that it puffs up and is light crispy and airy. He has two different options, the ting tostada and the green tostada. The ting tostada which was written about in the Toronto Life (which both friends I went with had!) was topped with chipotle chicken, creamy avocado, some Mexican crema fresca and slivered red onions lightly marinated in lime juice and salt. Of course I had to go for the one that included guacamole, hence the green tostada. Expecting the guacamole to already be made, I was over the moon when Alejandri began to make it fresh by hand with ripe green avocados, lime juice, salt and some jalepeno. Super simple, incredibly flavourful. It was then topped with a large slice of queso fresco (a Mexican cheese, quite mild), some cream (much like sour cream) and a whole plum tomato that was sliced so perfectly and delicatley you would think his hands were that of a surgeon! The tomato was seasoned with just a little bit of salt and then the whole tostada was topped with guajillo - a type of dried chili pepper. The day I went was also miserably cold and rainy and the pinto bean soup option just jumped off the blackboard at me! I love pinto beans, and with some toasted tortilla strips and a little queso fresco in the bottom, this soup could not have been more warming or delicious. A great start as I stood watching Alejandri make our tostada's! And finally for dessert - (this meal seriously came to a total of 15$ for the three items!) Lime Charlotte, a decadent lime cake that when served is drizzled with fresh lime juice, lime zest and a splash of good quality olive oil. The cake was extremley moist and the cream held so well with the lime flavouring. Needless to say, the three of us were extremley impressed. Alejnadri's skills are sensational, my eyes were glued to the precision, speed and perfectness of the food he prepared! I one day hope to have skills like that! For an amazing Mexican fresh lunch or light dinner I urge you to try Agave & Agucate! 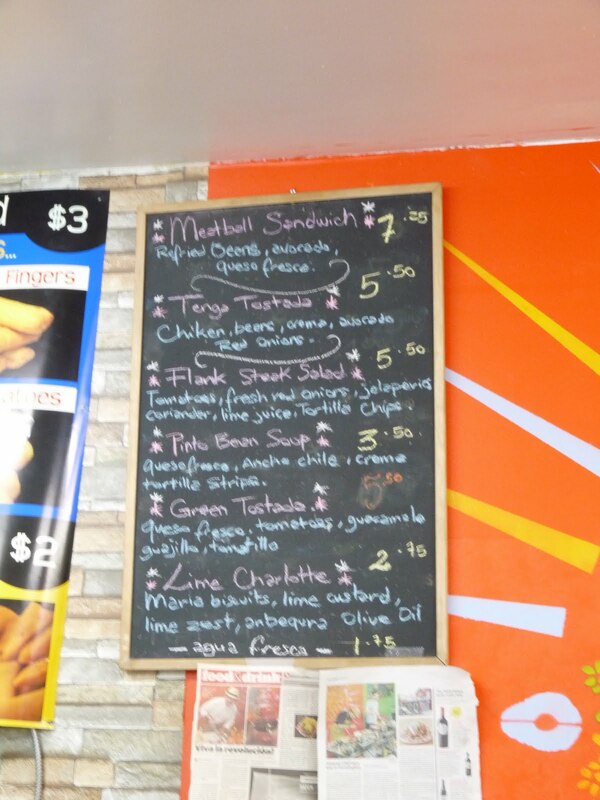 Agave y Aguacate, 214 Augusta Ave. (look for El Gordo Fine Foods), 647-208-3091.